Roman Totenberg’s art was first guided by 19th century masters Flesch and Enescu. He is world renowned for his unique artistry and repertoire covering the entire spectrum of violin literature. A master performer and teacher, he continued to impart his wisdom to younger musicians into his 101st year. Roman Totenberg has remained a presence in the music world since the age of seven when he first performed as a child prodigy during the turmoil of the Russian Revolution. Even today, four years after a final recital at age ninety-five, his days involve teaching, illuminating music, coaching artists for world premiere performances, and preparing the next generation of virtuosos, chamber music players, and orchestra members. Beyond his studio, Totenberg’s sound and principles embed generations of violinists among the world’s prominent orchestras and master teachers. A recent reminder of his interpretive art came in a 2004 radio program prepared by his journalist daughter Nina Totenberg for National Public Radio. The program can be heard on the internet and is linked to a few of his recordings, including Beethoven’s violin concerto. One captivated listener was this writer, who heard the concerto as an entity larger than life, technically and interpretively challenging. Totenberg has all the speed, color, and expression needed but unlike other performers, creates a repose supported by an assured mastery, an inner tranquility and temporal flow that unveil levels of meaning. Phrasing and breath seem to occur in the music on their own. 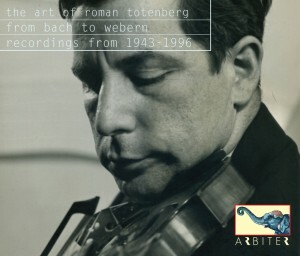 We anticipate the score’s energetic flashes contrasting with melodic lines but here we encounter an epic declamation in poetic metrics with seamless long bowing, varied articulation and a moving introspection: Totenberg plays from a state of deep listening, his hands a medium leading to his inner ear. “I developed by myself and … it took a long time, because [my father’s] personality was such that to live in contact with him, to make music with him, to play with him, you couldn’t but accept his line of playing, of making music, of performing. And these were certainly extremely valuable things that I learned and not only for his music. “That was limited by his aesthetics, which was well for him at that time. I know that he himself evolved not only in his music but in his concept of interpretation. . . he was then much more strict in his statements about interpretation. He had a great mistrust of most conductors and performers; it is more surprising that his written piano music has so few indications of how to play it. He was afraid to put in anything. He said, â€˜If I put in a crescendo, they will give me too much so I had better put nothing.’ But when he played he would put much more than the printed signs. He had a very sensitive and delicate touch. It was not at all dry and detached and aloof as he seemed to want people to play. Totenberg’s recollections of his early years drawn from interviews by Leon Botstein, who had studied with Totenberg, and Allan Evans, covering life up to 1938. When I started the violin, it was kind of a strange happening. We lived in Moscow. Our neighbor Ermolov was concertmaster of the Bolshoi opera, a charming old man, he must have been about sixty and he took an interest and started giving me lessons when I was six years old . The next year he started going to different places, gatherings, schools, to play concerts. He arranged a second violin part for me so I accompanied him and would come home with bread and butter. I was so proud of my earnings at that time. My poor father who couldn’t get food would go miles away for cranberries and I would come with bread, butter, and sugar. That lasted about a year. When moved back to Warsaw in 1921, I entered the Conservatory and worked with [JÃ³zefJ Zarzembski, a marvelous teacher of general music studies. He was very serious: you would bring several etudes every week, the next week all memorized. I went through all the classic concerti, Mendelssohn, Spohr. [MieczysÅ‚aw] MichaÅ‚owicz at the Chopin Conservatory [Huberman’s teacher] was a little more interested in music so I switched to him when I was fourteen and studied the Beethoven concerto and other works. I think I immediately knew that I would become a violinist. I never wavered from that except once when I came to Paris and happened to study mathematics at the Sorbonne. Musical life in Warsaw was very lively, not to mention the opera, and all the virtuosi came to visit, including Carl Flesch. At that time and later my idol was Huberman, who was an incredibly expressive performer of the grand literature — Brahms, Beethoven, Bach. I got to know him later and played for him: he wrote a letter to the Polish government to request a scholarship for me to go abroad. We became quite friendly and when he came to New York during the war I organized a chamber orchestra to accompany him in the two Bach concertos. He had helped me get to Germany and I was glad to return his kindness when he arrived as a refugee. Even then I was very impressed by how musical he was, regardless of changes in taste. At one point he began to use wire bow-hair developed in Germany and carried his resin somewhere in his concert dress’ pocket, suddenly grabbing for it during an orchestral passage to smear on the bow and then resume playing. Huberman’s recordings really don’t do him justice. It’s a completely different era and way of expressing yourself. At that time, people used strange slides: in the opening of his [Beethoven] Kreutzer Sonata recording with [Ignaz] Friedman he comes to the high â€˜A’ and slides down, it takes half an hour, obviously that belonged to the style of the time. He had tremendous technique and played very expressively with his bow. In his case, the vibrato was on the slow side but that was personal, I don’t think it was a common habit because [Jacques] Thibaud had a very French vibrato, rather sweet and fast. Huberman was uneven in his late years: some evenings you thought it was time for him to give up and find that at the next concert he could play divinely. I had played quite a lot of concerts by thirteen and I learned my literature this way. I had an engagement with the Warsaw Philharmonic to appear about four times every year, mostly for summer concerts and I became known for concerti, Wieniawski’s Faust Fantasie, Sarasate, and romantic mazurkas popular at that time. In addition to the conservatory I went to a “gymnasium”, an all-boys school in the afternoon, so during the morning I had a lesson and practiced. At the conservatory we took harmony, piano, counterpoint, composition, but no music history â€“ that wasn’t done. SolfÃ¨ge seemed ridiculous because people had to sing something and it was like saying the words in my language. A couple of us boys with perfect pitch snickered while the others tried to do it. At that time my hearing was so sharp that if someone would put their elbow on the piano I could tell how many notes and where they were. I met Szymanowski in Warsaw when I was seventeen. I played in a competition and he had been director of the Conservatory for a couple of years and led the jury. [Totenberg won the prize:] It was an exchange between young artists from Prague, Moscow, and Riga. Rudolf Firkusny won in Prague and came to Warsaw, I went to Prague, and Victor Babin was among us and we later met up later in Berlin. It was a very heart-warming experience to go to the others’ cities and meet their families, we were their guests. Firkusny had great success in Warsaw and after he played the recital, he asked for themes on which he would improvise. I was quite patriotic, knowing Polish history and having a sentiment for this subject, until the 1936 anti-Jewish riots broke out in Poland. Today when I go to Poland the folk art affects me very much, to Zakopane, where the mountain people are very musical and still play their instruments, and there are plenty of little bars always with a group of three or four musicians. We had a very demanding Polish literature teacher who had us write histories of authors. I had my whole family working like Bach’s, everyone doing something for me, drawing, finding references, a tremendous Polish literature factory. I had a painter friend and when I had to present a talk on literature, he painted charts for me. In Warsaw I often played with Gregor Fitelberg: Brahms’ concerto and many other works. Flesch came to Warsaw and played a Bach concerto. That was the time I played for him. I had thought of going somewhere, Berlin or Paris and when he came, my aunt (Alicja Simon, musicologist) introduced me. I played for him and he said “I will arrange a scholarship for you in Berlin, at the Hochschule.” I also tremendously admired the cellist Feuerman, an incredible musician playing everything with a complete ease. When Feuerman and Heifetz got together we had the impression that Feuerman beat even Heifetz, so to say, with his ease. One of the musicians from Berlin whom I kept in contact with was Szymon Goldberg, later the Berlin Philharmonic’s concertmaster [under FurtwÃ¤ngler.] When I met him in Warsaw, he gave a concert, he was eighteen or nineteen and I was fourteen and we were very impressed with his musicianship, his playing. I asked “How is it over there?” and in Berlin it was easy to contact him. It was an incredible time when I moved to Berlin at seventeen, after graduating high school and conservatory, at the time of the Mendelssohn competition. I played some Faust pieces and thought my right arm would fall off because I was so tense. There wasn’t time to practice much as we had very serious final exams that took a whole week. My career really started in Berlin and I became known, playing a couple of recitals every year and outside of Berlin quite a bit. I became a part of the musical and artistic life and was also interested in contemporary music like Hindemith and we just started looking at Schoenberg. Berlin was pretty far from Vienna in that respect: Vienna was very old-fashioned yet there were Schonberg with his disciples. Kurt Weill and many others were in Berlin so that was our daily life. All the operas we went to, and the symphonic concerts — FurtwÃ¤ngler would give a series of the Beethoven symphonies, and Bruno Walter did likewise, Klemperer would come and play with his [Kroll] opera orchestra and Erich Kleiber, Oskar Fried, Ignaz Friedman (I’ll never forget his Chopin Etude in Thirds), there was so much of it. And I remember very clearly Menuhin’s debut â€“ terribly impressive, really a kind of playing that came from nowhere and had wonderful expression. Later in life we became very friendly. Erica Morini was a wonderful violinist, particularly in Romantic music. She was a Sevcik student and later, many of my colleagues went to his class. I knew Morini quite well; she was one of those virtuosos who were impeccable and when she was older she was very expressive. She played the Tchaikovsky concerto in a marvelous way. I remember standing in the Berlin Philharmonic applauding like mad over her Tchaikovsky and someone said, “Oh, you’re her claque!” as if I was paid to do so. For the Germans, you weren’t supposed to applaud too much at that time. I studied with Flesch for about four years. When I arrived I had played the Brahms concerto and knew the literature more or less but what I discovered, learned, and appreciated was an understanding of how you approach music to learn it and how you dissect your technical problems. Once you get a composition that you want to play, it is like a crossword puzzle â€“ everything has to fit. Most of the teachers don’t quite understand that. When you get a new composition you must dissect it from a musical point of view: “How am I going to do it?” And from a technical point, “Where will I be on the bow, or does this place need more vibrato?” I don’t think anybody teaches it that clearly. Flesch was a heavy player using a slow vibrato. Hubay’s was a thin vibrato. The vibrato and bow have a relationship in that too much of one affects the other. We met twice a week, Mondays and Thursdays: the class was twelve and there were a few guests. Somebody would play and Flesch would listen to the whole performance. Something that I learned and use was to mark the part or places that one didn’t like, or a whole idea that may not be correct and should be changed. Once the student’s performance is finished, you tell them those things, at first generally, as we used to joke about Flesch, we would say, “Well, musically it’s not quite right and of course technically you don’t know it, but it was a pretty good performance.” It was a constant reminder so you learned that. He had a tremendous knowledge of the literature and would perform a whole work: there was always a pianist on hand. Flesch gave ten recitals in Berlin covering much of the violin repertoire when he made his debut. Flesch was in some ways very tolerant: “Do it with your nose, it doesn’t matter, as long as it’s good, but if it doesn’t work, I’ll show you how to do it better.” But also he had definite ideas as to how a violin should be played. For example, very clearly, how the division of the bow has to be absolutely devised so that you know where you find yourself: in one place you’re on the tip of the bow or the lower part, and whether you are close to the bridge or not, do you use light or heavy bow, how much vibrato, and so on. The left hand shifting is very important: how to time it, he made it very clear to you. I was really impressed after the first month or so, learning how to change my whole approach to violin playing so that it was no longer a mystery, that you could conquer anything you wanted to if you approached it properly. He mostly taught the standard repertoire but was always interested in other things. Ravel’s Tzigane was then a new piece and he was very impressed by Szymanowski’s Mythes. We played Respighi, who was relatively new, and quite a bit of Hindemith. I played many contemporary solo sonatas, Ernst Toch’s pieces, always on the lookout for new music. Flesch even performed some new works and concerti, for instance the first performance of a concerto brought by the Russian-American composer and violinist [Nicholas] Berezowsky. I started teaching when I came back from Flesch: everyone wanted to know what the big master had told me, like what the chief Rabbi had said. I was about nineteen in Warsaw and my teacher introduced me to a little girl, Ida Haendel and she asked me to give her lessons so I taught her for over a month and was very impressed with her talent. She is very kind: sometimes she puts me in her biography as her teacher. Then she went on to Flesch. I wrote to Flesch that I had heard he was in Baden-Baden for the summer and having students and asked if there was a chance I could come to study and how much would he charge for lessons. He wrote a very nice letter: “Yes, you can come, I would be glad to have you, my fee is 100 marks or nothing, and in your case â€“ it’s nothing.” I played chamber music with him. He had a chamber music series: I played second violin in his quartet and Pelliccia had to play viola. Flesch always took first violin and usually had Piatigorsky on cello. I got to know Piatigorsky then. We became friends and it was a wonderful time, great just to see him and be with him because he was very witty, full of life. Piatigorsky had a sound that was very special, a deep Russian sound, the melody just kept flowing. I have never forgotten the beginning of the Dvorak piano quintet in which the cello starts and how he would sing and play at the same time, usually in the rehearsals and that sound with the melody was just marvelous. Carl Friedberg was the pianist and occasionally Schnabel would show up but Friedberg was mostly there. The three of them commandeered our rehearsals and joked, there was always a nice banter, and for us it was a great, amusing, and warm atmosphere. Not only that but before and after a concert they would joke, making all kinds of intimate innuendos about their private lives, problems and so on and we would sit there all goggle-eyed over what they had to say about the ladies they knew and what would they do! One memorable time Flesch played the Bruch concerto with an orchestra at an open air concert in Baden-Baden and it was so full of mosquitoes that in the last movement he would slap his forehead during rests to kill them. Each time I play it I have to think about that! I was Flesch’s assistant in Baden-Baden. Felix Galimir came with his sisters who played in a quartet. It was the first time we heard Alban Berg, which was very impressive for us. Then Flesch insisted I teach Galimir’s sister and I was also helping Henryk Szeryng, who was four or five years younger than me. I stayed in touch with the Flesch group. Goldberg and I were in Aspen for a few years and very often I would send students to study with him at Curtis [Philadelphia]. Of the Auer group I had heard Milstein in Poland and later we became friends. I was terribly impressed with his technical ability and speed, he could play in some ways faster than anybody, with tremendous ability, but I was not so impressed with his artistic expression. At his Paris debut, he came about the same time, his wife, Piatigorsky’s, and the wife of [Karol] Szreter [Polish pianist] were their managers and all sat in the third row and I remember them waving their fists as they played, “Oh, that’s good! Oh, that’s not so good!” and when Milstein gave a slow encore, “Oh, they won’t understand this!” â€“ they were mad at him. Quite an experience to sit with them! Heifetz came late, around 1931 and not only was his playing very sensational but his posture, like a Greek figure, and his playing, absolutely serene, superb, very impressive. He appeared like someone out of Hollywood: his wife, an actress, had come along, reclining in a box, dressed in a boa, and we all noted this Hollywood scenery. At that time in Berlin we were already immersed in Baroque and contemporary music and the Auer school was great but irrelevant to what we were doing. The pianist Edwin Fischer was in Berlin and very interested in the Baroque; his influence spread to everyone. The Hochschule had a big musicology section and I had already played the violino piccolo in the Bach Brandenburg Concerti. We were looking into the French and Italian repertoire. No one played Ysaye’s works as yet, not at all, and they ridiculed Ysaye’s compositions. Flesch’s joke: Ysaye was traveling to America on a ship and there was a terrible storm, and everyone thought they would perish. Then the ocean opened up and Poseidon said, “If you throw out all those Ysaye compositions, maybe I’ll let you go through.” I never heard Ysaye play. I was too late, but Flesch was very impressed with him. Flesch first gave me a Pressenda violin to play, then I was loaned a Guarnerius in Berlin that I brought to Paris and later returned. At that time people were willing to lend violins from their collections, such as the Mendelssohn family. I won the Mendelssohn Prize after finishing the Hochschule. It was a public competition and I played the Brahms concerto with a pianist and some Bach. Siegfried Borries was another competitor who became the philharmonic’s concertmaster. I met the Dows family, an American family living in Berlin who helped me tremendously. They stayed for three years and we became close friends. Alice Dows was a patron who helped create the Washington [National] Symphony. I went to Paris in 1932 because of Hitler. I saw that it was really coming: the S.S. beat up some colleagues and friends and I moved to France with the Dows. I always wanted to visit Paris and see what was happening in music, contemporary music especially, it was so different, and also to find out about their instrumental playing. Szymanowski was a regular in Paris and a Polish colony had a very active Association of Polish Musicians. At this time they had a great interest in contemporary music. I became acquainted with [Carlos] Chavez â€“ he wrote a little sonata for violin, and Piston’s music: I performed all of them. Stravinsky was there, [Nadia] Boulanger — with whom I played. Serenade was an organization presenting contemporary music and Parisian society had to come as it was an elegant and quite successful prestigious place for contemporary music. I also took a few courses in Mathematics, because at that age you want to try other directions, but saw after awhile that I didn’t have enough time to practice and do serious work as a violinist. I decided to study with Enesco. He was connected with the violinist Yvonne Astruc’s Institut Instrumentale. I played for him privately and at the school and it was really a great experience. Enesco was much more musically inspired than Flesch, with an absolute knowledge of the literature and a phenomenal memory. Flesch was interested in the work at hand and how you would play it â€“ more inspiration here, more sound there. Enesco would pull out a symphony right away and say, “Look, this is like the passage here” so it created a completely different atmosphere of music. I was very impressed by his playing. Milstein played fabulously one of the Bach partitas and two days later Enesco played it in recital at about half of Milstein’s speed but it was so much more rhythmical and expressive in every respect. I knew that this was what I admired, what I would like to do, that was very clear. In Paris during these years I had lessons with him, played solo and some chamber music at the Polish club’s concerts series and with the cellist [André] Navarra, and also in quartets with Enesco and Pierre Monteux on viola. We covered much of the literature, including contemporary music: Monteux knew it by heart and all the Beethoven quartets. Paris was different from Berlin with its constant mix of painters, musicians, dancers, another world. When Szymanowski’s Harnasie was staged by Serge Lifar, I saw them quite often and there were always questions on how to do something and work with the scenery painters, a more modern way of looking at a work. During my first year in Paris I was interested in learning the Debussy sonata and noticed that no performances were given at all that year, no one seemed to care or want to bother with it. I sought advice from Marcel Ciampi, a Debussy pupil. It is not like his other music, its new style is different and difficult. We worked on phrasing and tempo relations, and he mentioned Asian music’s influence on Debussy, his interest in it, how he first heard about it from his Russian pupils. I met Milhaud and through him, Dallapiccola, who was also in Paris. I traveled around Europe at this time, mostly to Scandinavia and England. My father had died soon after I had arrived in Paris and I went back to Poland in 1935 to play concerts and to see my mother and older sister. My mother then joined me in Paris. Mrs. Dows contacted Carl Friedberg’s sister Annie, a New York concert manager, and they organized my first tour to America in 1935. I gave solo recitals throughout the country and made a concerto debut in Washington â€“the Beethoven, with Hans Kindler conducting. I played in New York’s Town Hall with pianist Arpad Sandor, a famous accompanist for instrumentalists who played with Heifetz for several years and was a vocal coach. In the summer of 1937 I toured South America with Arthur Rubinstein. We had met in Warsaw and I knew his wife and her family very well â€“ the Mlynarskis. Her father [Emil] was a conductor of the Warsaw Opera, a composer, and violinist. Rubinstein asked if I could come with him during the summer, as his manager could use a violinist. It was wonderful! Rubinstein and Nela were with their first two children. We sailed to Brazil, where each of us gave recitals playing separately but once in awhile together. He had a tremendous personality, very outgoing, admired by all, taken everywhere by society. He was a wonderful pianist, that fluid beautiful sound, a great repertoire, incredible memory, and knew the violin literature very well because of his friendship with Paul Kochanski. Nobody could get a visa to America in the 1930s, not of our persuasion, so to say [laughs]. I had toured America every year after that first visit and in 1938 felt it was time to stay. There was no problem for a concert visa as I knew the U. S. Embassy staff in Paris and when I played there they made me an offer: “whatever you want, we can help.” They said I could have a permanent visa but couldn’t play concerts right away. So when Helen Hull [arts patron] wrote a letter on my behalf, which she did for many other musicians like Firkusny, they switched visas at the last moment and I came as a visitor. My mother arrived in the U.S. in 1939 on the last train from Paris to Spain for a boat to the USA.